By maintaining the company as a family owned and operated business, We believe it has allowed our company to excel by keeping the pride and integrity in our work. It has also allowed us to stay competitive with larger companies through the tough economic times. 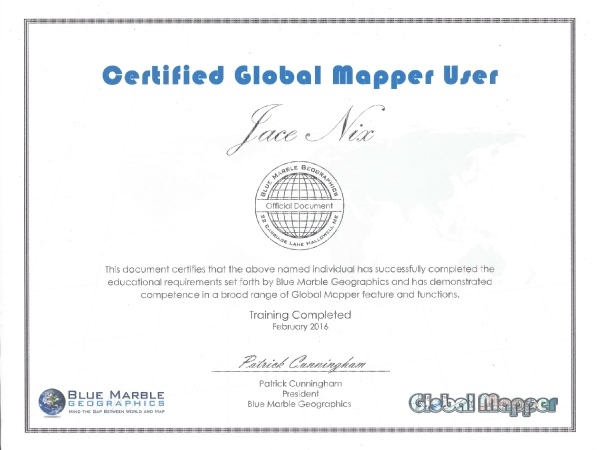 Jace Nix and Clayton Lowther are both certified in Global Mapper. Global Mapper is a GIS software suite that enables us to convert, compare and work with various data sets, to provide our customers the format of data they need.